Bryan Cranston, that name holds such gravitas doesn't it? Like anyone who has seen Breaking Bad I will always idolise him. I LOVED Breaking Bad, Towards the end I was lapping it up like a thirsty St. Bernard. I didn't want it to end but the show had seeped into my veins and was all I was capable of thinking of. I had encountered Cranston years before as hapless father Hal in Malcolm in the Middle and remember admiring his ability to turn what could've been a background character into one you loved and wanted to see more of on screen. Since the huge success as Walter White you can't blame Cranston for staying clear of TV roles. How do you follow up one of televisions most iconic characters? Well, it might surprise you to learn that Cranston has done it again with menacing bad guy Vince in show he co-created for Amazon Prime. 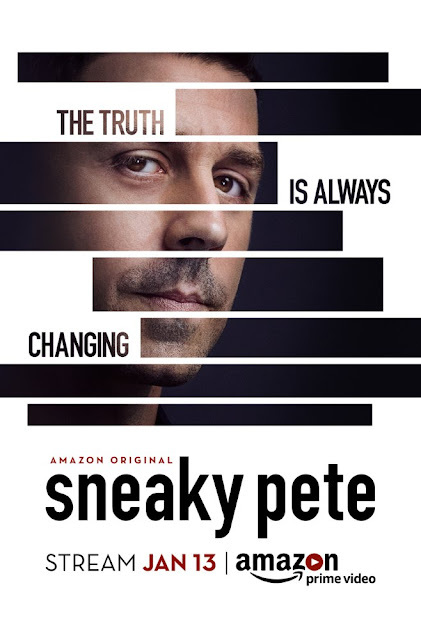 The show, Sneaky Pete (the title comes from Cranston's childhood nickname) focuses on superior conman Marius played by the cool, calm and collected Giovanni Ribisi. Marius is an expert conman, he counts cards and makes his money by ripping off others. In Cranston's Vince though Marius has met his match. Marius tries to con Vince but when Vince discovers who Marius's intentions he turns nasty. We've seen Cranston play the villain before but Vince allows Cranston to show off more of his talents. Vince is dangerous because he's calm, he can be explosive but you never quite know what he's going to do next. To escape Vince quick thinking Marius stages a bank robbery to taken to prison. During his sentence he gets to know his cellmate Pete who regales him with stories of his idyllic childhood on his Grandparents farm with his cousins. Marius had a very different background, living hand to mouth with his mother never knowing who his father was. Days before his release he receives a call from brother Eddie (Michael Drayer) who informs him Vince is still very much after his blood and he still owes him money. Quick thinking Marius decides to use his skills to assume Pete's identity and start a new life with his perfect family. Having not seen the real Pete in twenty years his Grandparents welcome with open arms. Marius has to draw on everything and anything Pete has ever told him about himself and his family to fit in properly. We then meet his cousins single mum Julia (Marin Ireland), police officer Taylor (Shane McRae) and sixteen year old Carly (Libe Barer) Julia runs the family business of chasing down felons who owe debt or don't turn up for court appearances. This puts Pete, sorry Marius is an awkward position as soon discovers he knows the first person Julia is after. What follows is an interesting caper reminiscent of BBC1's Hustle as Marius and Julia try to trick their fugitive into meeting them whilst Marius has to also keep up his pretense as Pete. Let's a lot to like in the pilot. Everyone gives an engaging performance and it moves at a good pace. Anyone hoping for a lot of Cranston will be disappointed as in this first episode its his presence rather than the man himself that looms large in the background. The show has had a rocky road to its eventual resting place on Amazon. US network CBS commissioned it back in 2014 but passed on the project after seeing the pilot. Amazon took up the show in June, re-shooting key scenes before the pilot eventually found its way to the streaming service in August 2015. To further complicate matters it was announced last year that Cranston's co-creator and showrunner David Shore (House) as was to be replaced by Graham Yost (Justified, The Americans) who would be taking over as executive producer and showrunner. So, the series eventually launches properly today (Friday 13th Jan 2017) on Amazon. The 10-part series feels slightly grittier than the pilot which was baked in bright sunlight. Yost and co have decided to use flashback to tell Marius's story and have given Cranston more time on screen to flex his villainous muscle. The second episode of the season focuses on Marius's life prior to arriving at Pete's as he learn Pete's family have a safe. Younger cousin Carly informs him there could be up to 1000 in the safe, could this be Marius's ticket out of his mess with Vince? The story also further explores what has happened to to Marius's 'crew' during his time inside. His brother Eddie is reluctantly working alongside Vince as is Marius's girlfriend Karolina (Karolina Wydra). The series also appears to be moving away from the initial 'con of the week' format that seemed to be established in its pilot. Cranston is his usual magnetic self whenever he gets to chance to appear on screen but the entire cast are wonderful. 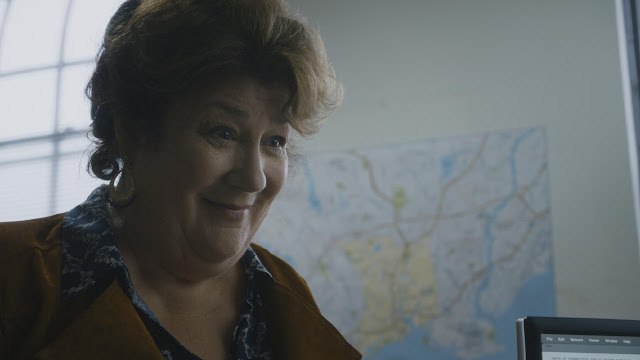 Ribisi as Pete/Marius is full of nervous energy that can't help but draw in and special mention has to so to Marin Ireland as Julia and the always dependable Margo Martindale as Grandmother/matriarch Audrey. It might take a few episodes to find its feet but it's incredibly easy to watch an awful lot of fun too. I've yet to find an Amazon show that I can get sink my teeth into but this is is. There's plenty of characters to care about and everyone is giving it their all, there's a lot to like. Sit back and let it wash over you! Sneaky Pete is available to stream in its entirety from Amazon.